Tsering Gurmet from PAGIR in the high Himalayas is in Delhi for a few days for a retail workshop. He came into the studio on the morning he arrived to work on a couple of new products for their sewing unit. Pagir collects tailor's waste from around Leh and makes it into various products for sale with a focus on their own shop and holiday makers visiting the mountains. 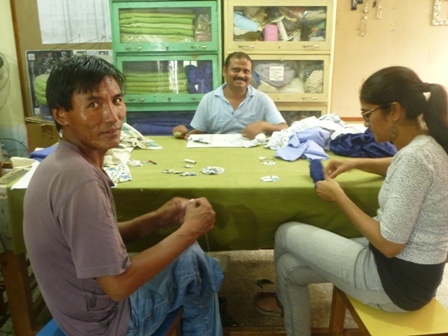 The tailors and their shop keeper are all people with disabilities and their goal is to provide employment for people with disabilities and recycle waste so as to protect the delicate mountain environment at the same time. 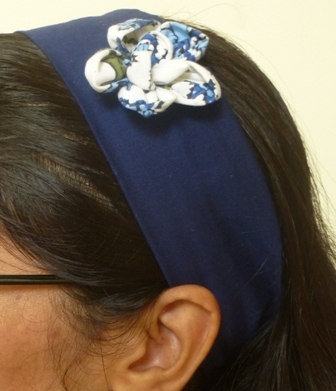 With just a day available Gurmet and MESH Designer (Syamala) work on a hairband with a pretty flower attached and also on perfecting a cushion cover with a neat zip in the back. I think he will pop back after the retail workshop to learn how to make another style of cosmetic bag to add to their present range. 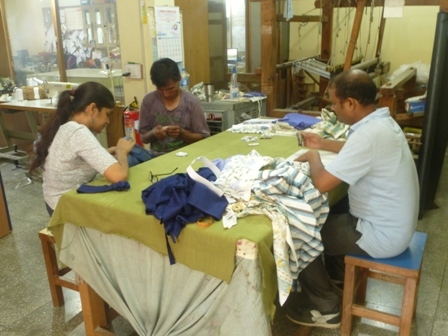 When MESH first started with Pagir it was with the goal of improving the quality of their sewing and providing training in how to make a wider range of products. Gurmet was saying that sales from their little shop are up this year in part, he believes, because they have an increased range of products stitched to a high standard. Ahhh music to our years!